That’s right, SoundBytes is back for our first post-Blip show, with a new night and a new venue and some new names who are lighting up the chipmusic scene. First up for his first SoundBytes we have Slato, who was a regular at Mana Bar Brisbane’s “Pocket Music” nights. You may have seen his awesome performance at the recent open mic, and he’s bringing his gameboys back to Melbourne to get you moving. Next up, rebelling against the game boys we have a double shot of Amiga epicness from two of Sydney’s finest. 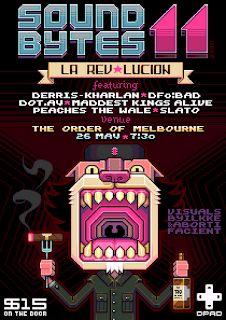 DF0:BAD who you may have previously seen performing as Vicious Cyclist will be a gabber kick to the face, while Australia’s favourite performing “wale”, Peaches along with her dad godinpants, will be performing amazing aquatic inspired jungle d&b for your listening pleasure. 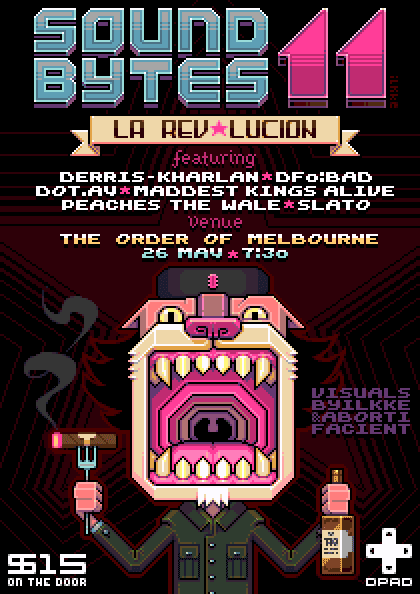 Of course, we haven’t forgotten our local talent, with Maddest Kings Alive, Derris-Kharlan and dot.AY rounding out what is sure to be a stellar lineup. And, just for a little something extra special, with an AV setup like The Order has (trust us it’s amazing! ), we’d be crazy not to have visuals too to round out the evening so for the first time at SoundBytes we have Abortifacient and iLKke (yeah the guy that makes our amazing posters!!) ensuring that you’re not only getting the audio chip experience but spectacular visuals too.